On August 16, the Crystal Serenity will steam out of Seward on a historic trip. The vessel will be the first big luxury liner to chart a course through the Northwest Passage, stopping in Kodiak, Unalaska and Nome before cruising through Canada’s far north to Greenland and then south to New York. The unprecedented voyage is generating excitement—and some trepidation. Cruise ships have been plying Arctic waters for years, but the Crystal Serenity will be the largest by far to chart a course through the Northwest Passage. The luxury ship will carry more than 1,000 travelers and 620 crew members on a journey that will take an estimated 32 days, and comes at a cost of $21,000 per passenger. It marks a turning point for tourism in the Arctic, which has seen a steady increase in ship traffic as a warming planet yields more and more ice-free water in summer. For some, it’s an exciting shift. In Nome, Harbormaster Lucas Stotts said there’s a lot of enthusiasm for the arrival of the ship, which will actually have to moor offshore, as it’s too big for the harbor. “For us, 800 to 1,000 passengers is an awful lot of folks coming ashore when we’re used to seeing the pocket sized cruise ships or the expeditionary cruises that have anywhere between 100 and 200 people on board only,” Stotts said. Others are looking on the unprecedented trip with some caution. David Aplin with the World Wildlife Fund’s Arctic Field Program said the region has opened up to traffic so rapidly that he’s concerned our reach there is oustripping our understanding of the place. “As the ice recedes and we create a new ocean at the top of the world, what we’re finding worldwide is that we’re unprepared for that increase in shipping traffic,” he said. Aplin and others say safety is the biggest concern when it comes to Arctic travel. Insurance company Allianz Global keeps tabs on international shipping, and its latest report shows that Arctic travel is relatively risky: Losses at sea dropped overall last year, but thanks to all the new traffic, the number of incidents in the Arctic jumped by nearly 30% to 71 — a decade high. And mounting a mass rescue operation thousands of miles from the nearest deepwater port is difficult. Same goes for containing oil spills. The Coast Guard has been planning for a potential mass casualty event in the Arctic for years and is planning a drill near Nome, though it won’t happen until after the Crystal Serenity departs. There are other concerns about impacts to a fragile and stressed Arctic environment, and to the native communities who rely on it. Andrew Hartsig is the director of the Ocean Conservancy’s Arctic Program. He said cargo ships are usually looking for the shortest, easiest routes, but that’s not necessarily the case for cruise ships. “A tourism company is often seeking out the very places that are kind of most dramatic or seeking out congregations of animals, because that’s what the passengers want to see,” Hartsig said. 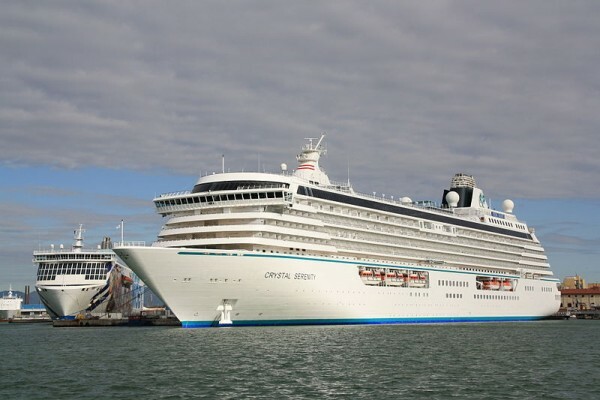 John Stoll, the Crystal VP in charge of managing the Northwest Passage voyage, said the company has been carefully planning this trip for three years. The ship has been outfitted with new ice-detecting equipment, including forward-looking sonar and thermal imaging technology. And once it’s in Canadian waters, an icebreaker on loan from Great Britain will act as a support ship, sending up helicopters for real-time ice recon. The RRS Ernest Shackleton will also carry emergency rations and a team of experts guides who will run special Zodiac expeditions for guests. “We want to be the cruise line that sets the example for how to do this and how to do it right,” Stoll said. He said Crystal has also planned carefully to minimize impacts. They’ll be exceeding international guidelines on wastewater discharge, he said, and they’ve been working with the tiny Arctic towns they’ll visit to make sure they won’t overwhelm the communities. Still, some are concerned about what Crystal’s trip heralds. Austin Ahmasuk is with the Kawerak Corporation’s Marine Program, which aims to give a voice to native villages as the world continues to talk about increasing Arctic traffic. He said there’s reason to worry about tourism’s impacts on subsistence resources. Despite that, Ahmasuk said, it’s easy for native communities to be left out of the conversation about the opening of the Arctic. “We want to make sure that the environment is not damaged, we want to make sure that our communities are able to sustain themselves, and we want to be able to participate in some decision making,” Ahmasuk said. When it comes to this trip, Hartsig and others said Crystal Cruises has done a solid job of planning. They said they worry about other operators who’ll come along later. It’s a mixed bag, Hartsig said: The only reason tourism can happen so far north is because of a warming climate, but maybe that fact will inspire visitors to care more about the environment. “For a lot of people the arctic is out of sight and out of mind, and if you have vessels like this taking people up to the arctic to see firsthand this environment that maybe being an optimist about it, maybe that will be the thing that really registers with people,” Hartsig said. There is, at least, a lot of interest. According to Crystal, the Serenity is sold out for this sailing, and is filling up for another trip in 2017.